Simply tailored suit jackets, as worn by both men and women in the 21st century, evolved from the elaborately designed formal clothing of the early 1800s. Suit jackets are often a staple in wardrobes, worn for an extra layer of warmth, as a design accessory over a shirt or dress, or as a part of a two-or-three piece suit, with matching paints and vest. Suit jackets that are too large can be altered for a better fit. Measure amount to be shortened. 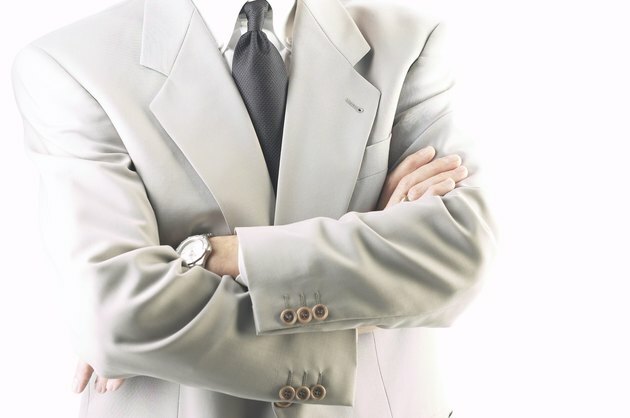 Suit jacket sleeves should end at the base of the palm. Remove any buttons that are within the sleeve allowance to be shortened. Detach the lining stitches from the outer fabric of the sleeve with either a seam ripper or scissors, using whichever sewing tool most easily reaches the stitches to be cut. Mark new hemline with pins, chalk, or disappearing fabric marker, and press the new hemline in place, using an iron at a heat setting appropriate to the material. Reattach shortened sleeve lining with needle and thread at the shortened hem; also sew on with needle and thread any buttons that were removed prior to shortening the sleeve. Measure amount of shoulder to be narrowed. Detach lining stitches from the shoulder edge of the upper sleeve using either a seam ripper or scissors. Trim front and back fabric at shoulder edge with scissors, tapering down to front and back sleeve edges. Remember to leave room for the seam allowance. Sew shoulder to front and back shoulder edge of suit jacket, using the original measurement for seam allowance. Trim lining excess at shoulder edge so that it is narrowed to the same altered width as the outer fabric, and tack to outer suit jacket fabric with a needle and thread. Measure amount to reduce suit jacket by at the sides. Detach lining at any tacking points (points where the lining is attached to the outer fabric with stitches) along seams at the sides and the bottom edge of suit jacket. Use either a seam ripper or scissors to sever the stitches holding the lining to outer jacket fabric. Sew new side seam on outer jacket, tapering to under the arm edge; press fabric with an iron and trim new seam with scissors. Sew lining side seam, trimming the same amount as for the outer fabric, tapering to under the arm edge; press and sew in the new seam with a needle and thread. Reattach lining to outer fabric, as you did with the side seam alteration using a needle and thread. The key to successfully altering a suit jacket is careful measuring all of the changes to be made. Should the lower sleeve edge have a vent or pleat, mitering folds will help the finished alteration look professional.